Infiniti Q50 Performance, Engine, Ride, Handling | What Car? 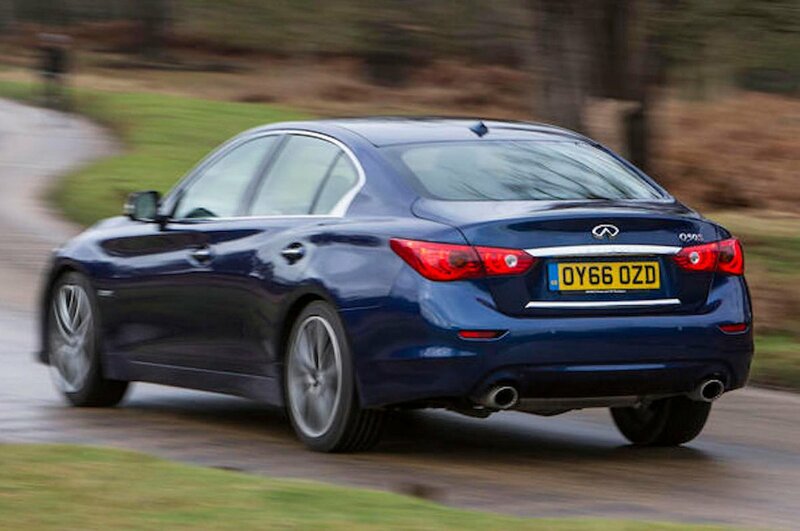 The Q50 range kicks off with a turbocharged 208bhp 2.0-litre petrol engine. It sounds a bit gruff at idle but it does settle down at speed. Unfortunately, it lacks the sort of flexibility you might expect from a turbocharged engine, and, for a similar outlay, Audi, BMW or Mercedes-Benz will sell you a like-for-like four-cylinder petrol saloon with significantly more power and a better claimed fuel economy. The hybrid on the other hand is seriously rapid - and economical - thanks to a 302bhp 3.5-litre V6 and a 68bhp electric motor. On the combined cycle it will return 45mpg and emit just 144g/km of CO2 - and without the 3% diesel BIK surcharge for company car buyers it makes a solid case for itself as a company car. That said, as a private buyer any fuel savings are likely to be offset by costly insurance and a high list price. However, if economy is not at the top of your list, and you're after maximum performance, then the range-topping 3.0t will be of more interest. This gains a 395bhp 3.0-litre twin-turbocharged V6 petrol engine - the smoothest and most powerful in the range. It's certainly fast, but while the standard-fit seven-speed automatic is smooth enough at normal speeds, it’s slow to respond at times. Ultimately, a BMW 330i would be a more engaging drive. Only one diesel engine is available; a 168bhp 2.2-litre unit that is unrefined by class standards. The engine’s clatter resonates around the cabin and there’s a lot of mechanical vibration, even at low speeds. The standard manual gearbox is notchy and unpleasant to use, so we would opt for the optional automatic. 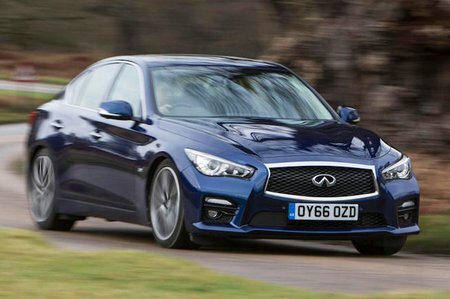 Dynamically, the Q50 also falls behind the best in class. The Direct Adaptive Steering system of the more expensive models allows you to alter the weight and responsiveness of the steering, but it feels fake and disconcerting. The standard set-up is better, but it still feels rather artificial. The diesel Q50 rides well, remaining settled much of the time, but the rear-wheel drive hybrid (we’re yet to try the all-wheel drive version) has an uncomfortably firm, jarring ride.